Chaos recently celebrated his 4th birthday. I'm not really sure HOW it's possible that he's four already. Anyway...he has been asking me to update the sensory bin for awhile so I thought his birthday was a great reason to change it out! 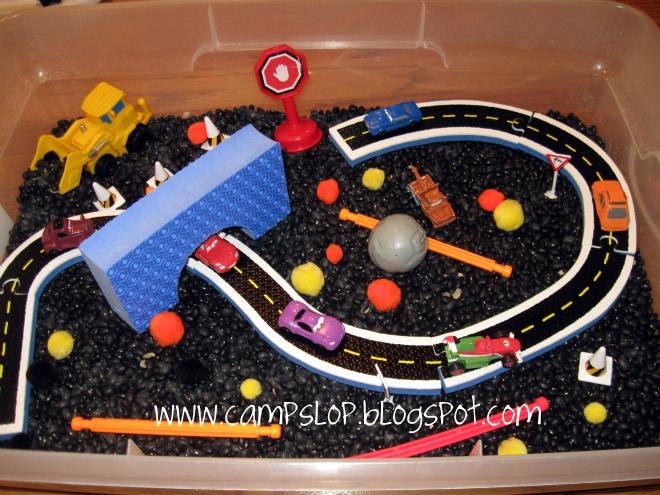 I decided to make a cars sensory bin for him. The base of the bin is black beans. 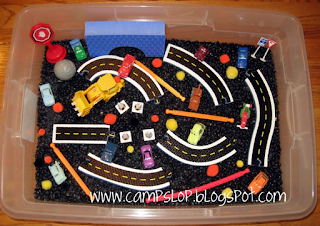 The roads are bathtub foam "stickers" that connect together. It's from Rub a Dub Stickers for the Tub by Alex. You could also make your own road using black foam sheets. The cars came from his Cars Busy Book (it was a gift, though I think Barnes & Noble carries them). I added in some construction cones, various signs, a boulder, pom poms, K'nex (for construction), a foam block "tunnel", and a bulldozer for moving black beans. It's pretty fun all set up and he has had a really great time playing with it. The bulldozer has buried the K'nex for "pipes", the K'nex have been made into lamp posts, boulders have blocked the street and, of course, there have been a few races too! Great idea! I bet this will be a favorite of his! Happy 4th birthday! Oooh I know a little boy who would love to get into this sensory box. Well done! Ive found you thru the weekly kids co-op. thank you for sharing.